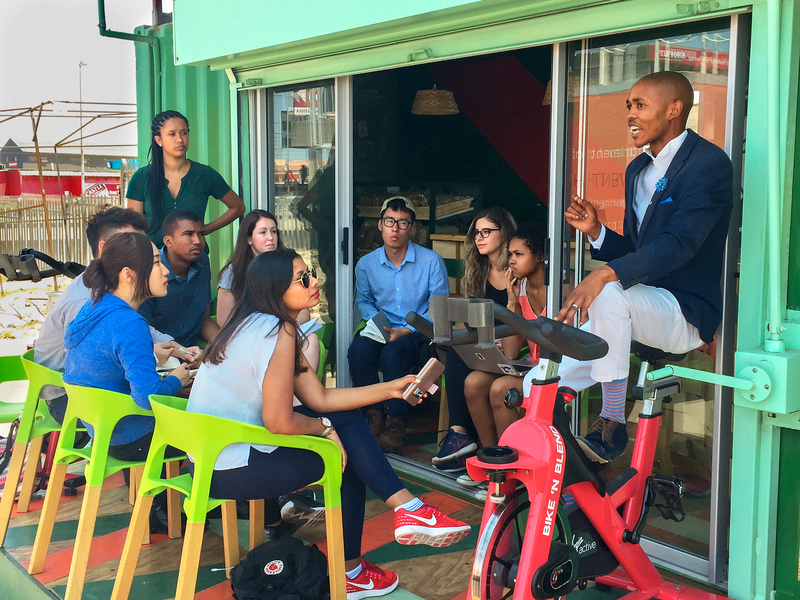 Cornell students from the spinach and lavender SMART teams, both led by Ed Mabaya, meet with Spinach King Lufefe Nomjana (right) outside his Cape Town café. Lufefe Nomjana, a young entrepreneur from Khayelitsha township outside Cape Town, is the Spinach King. With tasty, gluten-free spinach bread and a vision to bring healthy food to low-income South Africans, his company is attracting international media attention. Nomjana’s marketing commitment is uncompromising: he named his son, now three, Spinach Prince Nomjana. His café in a refurbished shipping container feeds locals and a steady stream of tourists. His problem is right next door. A chain supermarket in the same shopping center sells white bread for half the price to hungry, cash-strapped families. 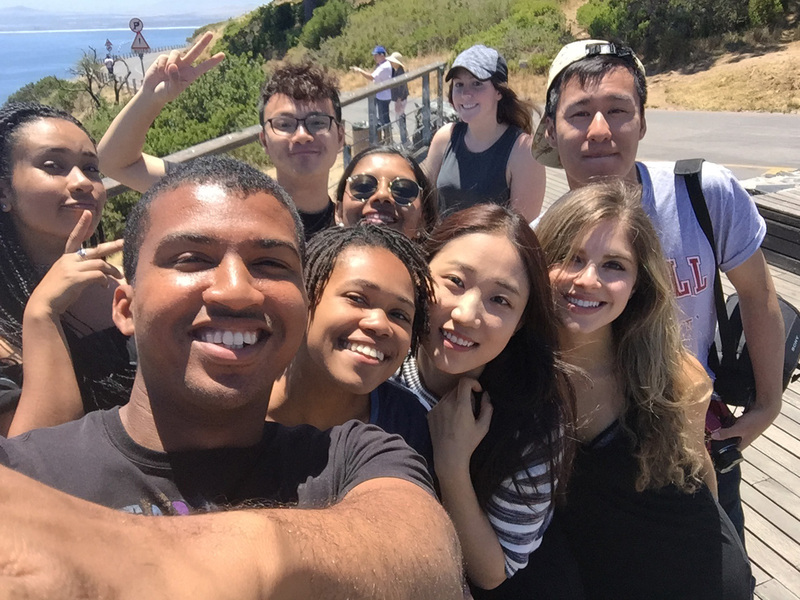 Nomjana’s company is one of four African social enterprises that partnered in 2017 with Cornell’s Student Multidisciplinary Applied Research Team (SMART) program, now in its 15th year. Part of the Emerging Markets Program in the Charles H. Dyson School of Applied Economics and Management in Cornell's College of Business, SMART sends compact teams of undergraduate and graduate students to consult with small businesses as they face new marketing challenges in developing economies. Traveling with Cornell faculty advisers, SMART teams meet and work on site with their international partners for two intensive weeks during winter session, then return to campus for a spring SMART course, where they compare notes with other SMART teams, complete their analysis, and develop publishable case studies about their clients’ business solutions. Many team members continue to consult with their international partners on a pro bono basis, even after they graduate. “We look for businesses doing something transformative for the community,” explains Edward Mabaya, assistant director of the Emerging Markets Program and director of SMART. Mabaya led teams working with two South African partners, a lavender farm, and Nomjana’s bakery and café. 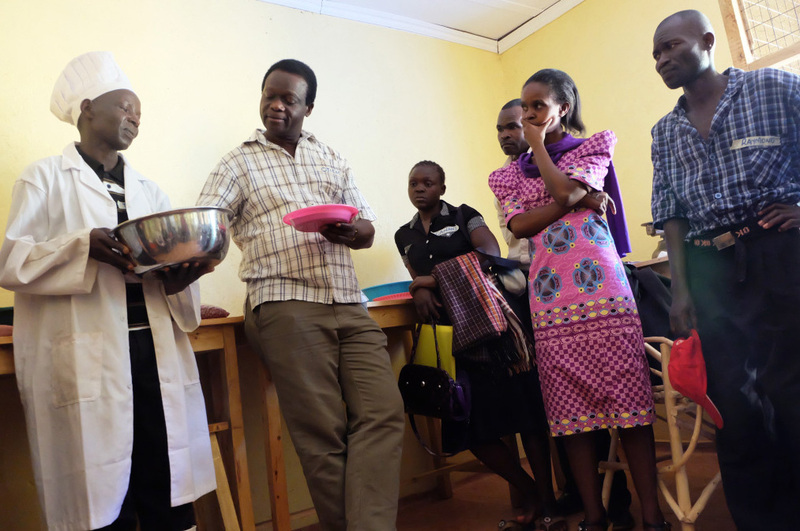 This year’s other SMART projects in Africa included a Rwandan essential oils business and Kenyan farmers developing high-protein porridge products. The four teams were supported by Global Cornell through the Andy Paul Africa Initiatives Fund. SMART also sent teams to Colombia and the southern United States in 2017. A black entrepreneur raised in poverty, Nomjana saw a need for healthier foods in the townships, where many people suffer from diabetes and other dietary diseases. He develops spinach-based recipes, educates his neighbors about the health benefits, and sources the spinach from local growers. With coverage from BBC, CNN, and local news, tourists have discovered Nomjana’s café—but as Mabaya says, “the problem he set out to solve is in the townships, where his product is needed most.” The SMART team’s challenge was to help the Spinach King benefit from his good press while reaching out to local customers with limited purchasing power. Nomjana is proud to offer healthy meals that township residents can afford, such as two slices of spinach bread and a cup of butternut soup for R15 ($1.06). To increase local foot traffic, the SMART team created a marketing plan that uses word of mouth, including discounts for referrals. Nomjana is also capturing tourists’ goodwill to offset costs. Now supporters can buy loaves to donate to needy households in the community—an idea that has really taken off, Mabaya says. The team helped Nomjana build a website and advised him to sell aprons and other souvenirs that include his popular logo. Supermarkets like the one near the Spinach King’s storefront café remain low-priced competitors, but as his business grows, Nomjana is supplying baked goods to some Cape Town retailers. “South Africa has a major national program to encourage black business ownership, management and hiring,” team member Ryan Shen says. The SMART team was able to recommend ways to take better advantage of these Black Economic Empowerment policies as Nomjana moves to scale up production. Yichang Liu, a fourth-year Cornell PhD student in Food Science and Technology, decided to join the porridge project because of its connections to her own work. Kenyans feed maize porridge to babies, eat it for breakfast or as a side dish, and even drink a thin version during tea breaks. Two community farmer groups in the Nandi Hills region have developed healthy porridge blends that include legumes like soybeans and peanuts. “It’s a high-protein food that also improves soil fertility,” Liu says. Farming group leader Joseph Tarus introduces the Kenya SMART team to the processing procedure for maize porridge. The farmers were already successfully raising the crops and selling their products on a small scale, but both groups needed to learn practical business and marketing skills to manage and expand their growing businesses. Led by Beth Medvecky, a research associate in the College of Agriculture and Life Sciences, the SMART team developed an intensive workshop tailored to the farmers’ needs, using peer-to-peer methods effective for adult learners. The workshop included everything from role-playing conversations with buyers, to a practicum on business bookkeeping, to product testing with students from a neighboring school. The SMART team developed an intensive workshop tailored to the farmers’ needs, using peer-to-peer methods effective for adult learners. With more accurate business records and pricing, both farmer groups are sure they’re turning a profit.